No Wind? No Grid? No Problem. The pumping technology of the 19th century was the windmill. The 20th century brought the power grid to these systems. In the 21st century and beyond, the solution is solar! Need more water than you can pump during daylight hours? You can supplement your RPS system with deep-cycle batteries, charged by the same solar panels that run your well pump. No more paying the power company and electricians thousands of dollars to hook up pumps to the grid. No more trenching miles of power cables. No more electric bills. How do Solar Well Pumps Work? Solar panels create power (direct current) when the sun is shining. That power runs through the connected wires to the RPS Pump Controller (the gray box pictured). Optimized voltage is transmitted down the well to the submersible well pump. The well pump then pushes water up through the connected plumbing (usually PVC or black poly pipe) to a hose bib or into a holding tank. If the high-water tank sensor or the low-water well sensor connected to the Pump Controller is activated, the pump will stop running to prevent overflowing the tank or running the pump dry. Water can be used directly with a gravity-fed system or can be pressurized/boosted. For additional gallons per day and as a 24/7 backup, 12V deep-cycle batteries can be added to power the pump. The RPS Pump Controller also acts as a solar charge controller to keep your batteries safely topped off! No more paying the power company thousands of dollars to hook up pumps to the grid. No more trenching miles of power cables. No more electricians. No more electric bills. The time for solar is now! 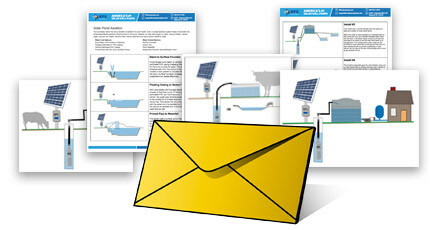 With our step-by-step installation guide, anyone can install our solar well pump. If you can connect terminal wires and connect plumbing, you’ll have no trouble doing this yourself. We also have a helpful step-by-step video to walk you through the installation process. Windmills are outdated, 19th-century technology, vulnerable to breaking down and prohibitively expensive to repair. These cumbersome systems are being replaced by the sleek, robust, and durable solar technology of the 21st century. Best of all, with solar, there’s no need to hook up to the grid! Over the past few years, solar cells and brushless motor technologies have made great strides. Our engineers have designed and manufactured our kits using the best new technologies for the most efficient and affordable systems anywhere. With an RPS Solar Pump, you’ll save over $1,700 in 5 years compared to an AC system! And no wasted time writing checks to pay utility bills! What benefits do DC pumps have over AC pumps running off a DC-to-AC inverter? While we are certainly advocates of DC systems, we are also engineers, so we’ve considered all the options in designing the most efficient pumping system possible. In general, the fewer times you need to convert energy between states, the more you can use for pumping. Running DC power from solar panels directly into a DC brushless motor is far more efficient than running it into batteries and then converting that to AC power with an inverter to run an AC pump. Remember that you will need an adequately sized pure sine wave inverter for most AC pumps (these are more expensive and more difficult to find than modified sine wave inverters). Most AC pumps utilize brushed motors as well, meaning the brushes need to be pulled up and replaced far more often. Brushless DC motors (like those in RPS Pumps) are far more reliable than AC carbon-brushed pumps and have a much longer lifespan based on actual pumping hours (close to 10x). Because DC pumps power up slowly, their performance is far superior to AC pumps if being cycled on and off, which is easier on plumbing as well. This is just our two cents, but we’d be happy to talk with you more about AC versus DC pumps if you’re interested! 95% agree these are helpful in planning for your solar pump! The pump is exactly 3 inches in diameter. The minimum well casing diameter we suggest is 3.5 inches. The pump is 2 parts. One is the super-efficient helical pump that actually drives the water up the well. The second is the brushless DC motor that powers the pump. They are both in the same beautiful stainless steel housing. The whole unit is about 18 inches long. Can I use a 3 inch pump in a larger diameter well? Absolutely. There is no issue using a smaller diameter pump in a larger diameter well casing. One of the main reason for a larger well diameter is increased water production. The larger well acts as a reservoir for longer pumping durations and the ability to produce a larger volume of water without depleting or drawing down the well. And no, the opposite is not true, a 4 inch pump will not fit in a 3 well casing. Don’t even try it. Trust me on this one! How much water do I need for my house? Short answer is between 75 to 200 gallons per day, per person, depending on your family’s water usage. That includes cooking, cleaning, showing, washer, etc. We have customers that come in on either end of this range. For an herb or vegetable garden count on 1 gallon per day for each square foot of garden. Our Pump Sizing Wizard helps you determine the right size pump based on your estimated water use. We recommend choosing a pump size based on the gallons the system can pump in 6 hours of sunlight. If that’s not enough, you can always supplement this with the optional use of deep-cycle batteries for more water volume. What type of motor do RPS pumps use? Our pumps use brushless DC motors. We prefer these motors compared to their brushed counterparts, since you never have to replace carbon brushes! They are maintenance free and are rated for many years of operation. Can I add an external switch to turn on and off the pump? Yes. With our controllers this is very easy to do using the tank overflow input. Simply wire and on/off switch to the tank high (Th, Tc) inputs. Operation will be opposite of how most switches are labeled. When the switch is open, the pump will run, when the switch is closed (short), the pump will turn off. A $1 light switch works perfectly. How does the RPS Optimizer differ from a standard pump controller? Our Optimizers have improved upon traditional controllers with some great new technology and new features. With maximum power point tracking (MPPT) the controller monitors solar panel performance and makes adjustments as needed to the voltage and current in order to maintain maximum performance. The MPPT feature improves overall system efficiency, especially in low light, overcast conditions. The RPS Optimizer controller also features low well shutoff and storage tank overflow sensors that some customers utilize. These will save the well from running dry and prevent over pumping and wasting water. There is also a Motor Speed setting. The motor speed setting on the RPS controller is a dial that adjusts the speed at which the pump operates. The pump can be set to operate at any speed desired and can be fine-tuned up or down to the amount of water needed on a daily basis. The RPS Optimizer controller is encased in a water resistant enclosure and is suitable for outdoor use. It features water resistant wire pass-through ports on the bottom, to prevent both moisture and bugs from entering the electronics. Power and external sensor connections are made easy by the use of clamping screw terminals. Only a screwdriver is required to make the electrical connections to the controller. Dimensions are about 8 inches wide by 9 inches tall. Where should I locate my Solar Panels? Ideally within 50 feet of the well so there isn’t a huge voltage drop over the distance. The ideal sites are in full sun all day without shadows. You’ll want the panels to face South. The optimal ‘Tilt’ angle of the panels is based on your latitude. Our detailed user manual provides more details to optimize your system. We also have some additional mounting information, photos & diagrams here. What is the best way to mount the solar panels? Why 90 watt and 100 watt panels? We only supply the highest quality mono crystalline solar panels currently available on the market. Our panels use Bosch solar cells made in Germany. These are some of the highest efficiency solar cells available, meaning they turn the most amount of sunlight into electricity. The panels are rated for a minimum of 25 years with minimal power reduction. We sell 90 watt and 100 watt solar panels since they are easy to ship without damage and can be installed by one person. Larger 200 watt solar panels are easily damaged in shipping and are usually too heavy/awkward to lift and install by one person. Our goal is easy to install solar systems and the smaller panels accommodate this. At the end of the day, they have the same performance at their larger counterparts and have the benefit of cheaper replacement cost in case on gets damaged. Are the connecting wires included? Yup. There are snap-in connectors for the panels. The panels in your system may be designed to be wired in parallel or in series. Both are easy to install and all the wiring is included. What are the panel’s dimensions? What type of well drop pipe do you recommend? We recommend 3/4″ black HDPE tubing aka “black poly pipe” for most usages. If you are making a long run, with a high volume pump, then you may wish to consider going to 1″ pipe. Both sizes are available at most big box home improvement stores for minimal cost. The pipe is flexible and comes in single pieces. The main benefit is when placing the pump in the well or pulling it from the well, you do not have to unscrew sections like standard PVC pipe which makes installation much faster. We do recommend using one 6 foot section of PVC pipe for the initial connection to the pump, to help keep it aligned vertically in the well casing. You’ll need enough polypipe or pvc to run the pump beneath the water level in your well. We recommend submerging the pump at least 50 feet so there is room for the low water sensors. If your well has a really low recharge rate you might consider going deeper so you take advantage of the volume held within the well casing. What is the connection on the pump itself? The Pump has a 3/4″ female pipe thread so you’ll need a coupling with a male 3/4 pipe thread to be compatible. If you’re using polypipe we recommend a barbed end to connect to the poly pipe with a couple high quality hose clamps. There are eyelets to attach a rope as well so you won’t have to worry about losing your pump down the well. Can I make a long horizontal run from the well head to a distant storage tank? Yes, this is not a problem and has minimal impact on flow rates. One of our customers recently made a 1700 foot horizontal run, using an RPS1.8-80 system, to his 3000 gallon storage tank and was still achieving over 6 gallons per minute. The elevated storage tank they distributed the water to 5 different livestock troughs throughout the ranch. Can I use existing pipe and plumbing with the pump? Yes. All RPS submersible pumps have 3/4 female pipe threads, so you just need the correct fitting for your pipe size, available at all hardware stores. How does solar compare to 120V ‘grid-tied’ pumps? AC pumps are very similar to solar pumps, but are not optimized for efficiency. They are usually oversized, so they only pump for a few minutes per day, jolting on and off. With a solar pump, it is best to pump at lower flow rates through the entire day, so most solar energy can be used. 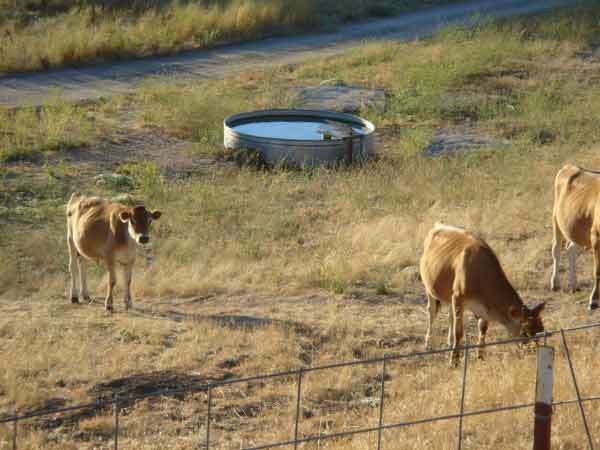 Can I use a solar well pump in a pressurized system? Short answer is yes. If you want to run a pressurized system off of a solar well pump you have a few options, also shown in the diagrams above. 1) Install an elevated storage tank. Every 2.31 feet in elevation gets you 1 psi. You’ll need a good size hill if you want good pressure. 2) Install a separate DC booster pump with battery backup and its own solar panel which pressurizes the bladder tank from a separate storage tank. The well pump fills the storage tank during the day, and the booster pump keeps water pressure throughout the day and night. The booster pump is much lower power and does not have to pump water from deep underground to maintain pressure. Therefore it does not require quite a large battery bank to make it through the night. Most people can get by with one gel cell for a 12V booster pump. Can I run the pump on AC power at night? Yes. You can use an AC to DC power converter to run off of main power during the night and feed into a controller with battery backup. The converters cost about $200 and you most likely would want to put a diode in series to prevent the controller from trying to charge the controller. This would be a very robust system. While you need to think ahead to plan out your system, once complete they are very capable and robust systems. They are modular in case you need to replace a specific component or add more capability in the future. I always recommend to purchase the basic system, set it up and try it for a few days. If you need more water, additional solar panels can be added with batteries for increased performance. Yes! 90% of our customers install themselves. Installation takes less than a day with our detailed installation guide and no experience is necessary. The record is under an hour, but most people take 2-3 hours. Can you install this for us? If you are in the state of California, it is very likely we can install the system for you. There is an added cost for this installation depending on your distance from San Fransisco and we can work with you to provide a quote for your exact needs. Simply send us an email and we can get started! What scenarios would a solar pump NOT work well? Commercially available solar pumps have a maximum head of around 650 feet. This is the main limitation of solar pumps, as beyond this depth, it takes a huge amount of solar power to pump the water to the surface. 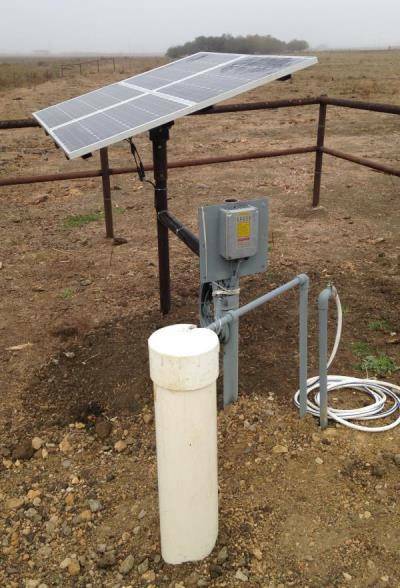 If your static water level is less than 650 feet, it is very likely a solar well pump will work for you. If you’re unsure call us! How can I shut the pump off when the water storage tank is full? All of our controllers come with a tank high shutoff input and float switch. Simply install the float in the tank or water trough and when the water reaches and lifts the float, the system will automatically shut off. Once the water level drops, the system will turn back on and begin filling the tank. How long do your systems last? Our well pump systems are designed for harsh environments – for years and years of reliable operation. The motors are brushless and rated for many tens of thousands of hours of operation. That’s hundreds of thousands of gallons of water pumped! The pumping mechanism is the only ‘wear part’ and is rated to last 5+ years without replacement. Plus, all of our solar well pumps have a two year warranty. If anything happens within 2 years, we will immediately send out replacement parts. Who will service my pump? Parts? We guarantee 85% power output of solar cells after 25 years. Plus, we offer the most comprehensive 2 Year Warranty on all our solar well pumps for added peace of mind. (yes, longer than the iPhone warranty) We believe in our products and our limited liability warranty is to protect your investment from manufacturer defects. If there are any issues with our product during the first 2 years, please contact us for an immediate replacement. Like most pumps, the impeller/pumping mechanism is the part that sees the most wear and tear and this can be replaced easily in the field with a screwdriver. (spare included free!) We also keep many spare parts in stock and will ship them out immediately. More on our 2 Year Warranty here. Will I need an electrician? Most customers install their RPS systems themselves. We give you all the information in the easy-to-follow manual that you need to do so. While you will be working with electricity, it is all DC current like your car or truck, so it’s far lower voltage than your household outlets. It’s still important that you take the safety precautions outlined in our manuals. If you have a more complex system or you’re unsure of any steps, you can talk to our electrical engineer Mike and make sure your system wiring diagram makes sense before hooking it up. What maintenance schedule do you recommend? Every 3-6 months we recommend wiping down the surface of your solar panels, more often if you’re in a dusty area. Every 5-7 years we recommend replacing the helical pumping mechanism if flow rates show any decrease. We include a spare pumping mechanism for free for this purpose. Though you’re in charge of making sure you don’t lose it! If you’d like to get a little more efficiency out of your panels, you can read on our mounting page how to adjust the angle of your panels to maximize output based on the season and latitude. I love the dog on your homepage. What’s her name?! Only if you want one. The pump has no check valve so the line can drain and prevent problems with freezing. There is no problem with adding a check valve, but you will want to make sure the line drains if you have freezing weather. If the line freezes and the pump runs, it can over pressurize the system. Can I get more Technical details? Yes. This page gives you a glossary of terms and more nerdy details about all parts of our systems.